Kenya sand dams capture surface water that would normally be lost as stream flow. To prevent losses of run-off and stream flow, building what are known as” sand dams”, is one method of capturing surface water during a wet season and storing it for later use during the dry season. 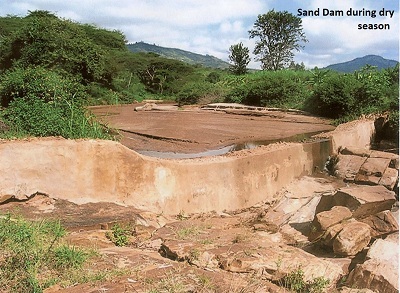 Sand dams are small impermeable barriers constructed across the bed of seasonal streams. Sandy river beds are required for a sand dam to work properly. 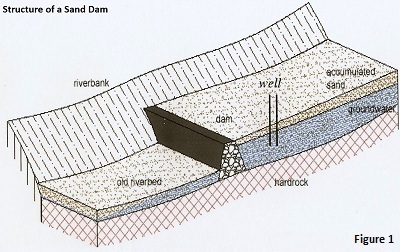 The function of a sand dam is based on the settling out of coarse sand upstream of the structure (see Figure 1). Water flow is impeded behind the impermeable barrier of the dam, and sand settles out behind the dam. 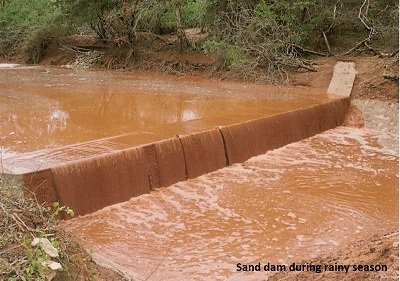 Sand dams are relatively low in height and they allow high water to flow over the dam and continue downstream. As sand builds up behind the dam, an artificial aquifer is created and the natural water storage capacity of the riverbed aquifer is enlarged. The aquifer fills with water during the rainy season. When the artificial aquifer created by the dam is full, usually within one or two large rainfall events, the river starts to flow over the dam and downstream. The slowing of the stream flow results in capture of water normally lost to runoff, and storage of that water within the artificial aquifer. The “center of the universe” for sand dams is the Kitui District of Kenya. The SASOL (Sahelian Solutions) Foundation started building sand dams in Kitui, along with community participation, in 1995. Since then, SASOL has constructed over 500 Kenya sand dams in the area. This water catchment strategy is recognized as one of the most effective and prominent water access strategies in this semi-arid region. 1.	that they take advantage of simple technology and a principle that local communities are familiar with; the collection of water from the beds of sandy seasonal streams. 2. They utilize simple technology that is inexpensive and construction materials that are locally available. 3. The average cost of a sand dam that can last as long as 50 years, is about 7,500 USD. In addition to providing drinking water, Kenya sand dams also provide water for rural commercial activities such as small scale irrigation (row crops and tree crops), and a water supply for nearby village and industrial activities like brick making. Also, as with any good water resource development, since less time is needed to fetch water, so school attendance increases significantly and more time can be spent on other income generating activities. •	Protect the water source against evaporation since the water is stored below ground in the sand aquifer. Return to "Surface Water" from "Kenya Sand"